The Knowing suspended at the core of the facility. The human colony world of Ariel housed an underground facility built by the Forerunners. The complex contained the AI construct known as the Knowing. The entrance to the facility was protected by a reinforced door and a corridor rigged with three layers of crisscrossing laser beams. The beams, however, only covered the lower half of the corridor. The full extent of the complex is unknown; while the colony had two archaeological digs placed approximately four kilometers from each other, it is uncertain whether both contained access ways to the facility. By the time the Covenant attacked the planet in January 2552, the complex had been under excavation for some time by the planet's civilian xenoarchaeological teams. However, they had not yet gained access to the interior. 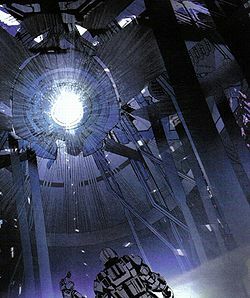 During the battle, the Covenant rounded up the civilian population and used them to spring the traps at the entrance in hopes of finding a safe way inside. The two ODSTs, Kojo Agu and Taylor H. Miles eventually succeeded in evading the laser traps by carefully passing over them and then melting the door with an overcharged shot from a plasma pistol. Inside, they discovered the Knowing and inquired it about its purpose. Upon learning of all the information it possessed, the humans deemed it too dangerous to fall into Covenant hands and told the Knowing to self-destruct. The AI obeyed the wishes of the Reclaimers, and the two made their escape as the Knowing was destroyed, and the complex along with it. Dutch and Romeo at the entrance to the facility. Dutch and Romeo making their way over the laser traps.